Authentic to the period, our Oberlin Mission Bed offers clean lines, straight slats, and gentle curves - providing a versatile bed that is sure to look great no matter the decor. The subtle sleigh bed shape is classic to the time period and will offer a glimpse into the past, while providing the modern woodworking techniques that ensure a bed that is made for a lifetime. The bold design of the head and footboard offer a familiar Mission slat design, while the gentle arched top trim pieces create a touch of modern elegance that bring the entire piece to life. Below, rectangular feet surround the slats and connect to solid wood side rails, firmly holding the head and footboard together. Between, a solid wood slat system connects the side rails together, providing a firm base for your mattress and box spring. 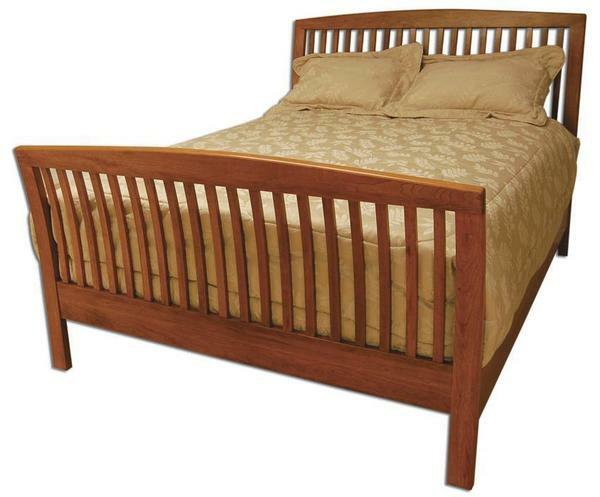 Once assembled, this beautiful bed will offer you a lifetime of service, with the integrity to serve as a family keepsake that can be handed down and enjoyed for many future generations to come. Customize this bed and make it your own by choosing the perfect hardwood and finish options to match your decor or complement your existing suite. And, while this decision may be an easy one, we understand if you need some time to make a decision on the wood and finish combinations. No problem - just give us a call to place your order by phone and we'll send you samples, so you can see the combinations in your setting to ensure you're getting the best combination. Great craftsmanship! I commented on the finish already and that was the only nitpick. Luckily I am an avid woodworker and adding the extra detail to the finish was not much of an issue.